Find the perfect desk for your budding artist in the new year! DIVERSIFIED WOODCRAFTS Drawing Table System with Drawers: Start your artist's 2018 with a brand new drawing table system for all their needs. This beauty is made of solid maple and is held firmly together with a sound mortise and tenon joint construction and steel plate reinforcements. The six drawers are perfect to store all art tools for when they are needed. The mounted pencil stop is perfect for all your pens and pencils. If you do graphics arts, this desk is perfect for your computer, keyboard, and monitor. The fiberesin two-piece 3/4" tops makes the perfect working space. The 30”W x 30”D sides make them easier to manage and work with. Plus, the desk will be easy to keep clean. 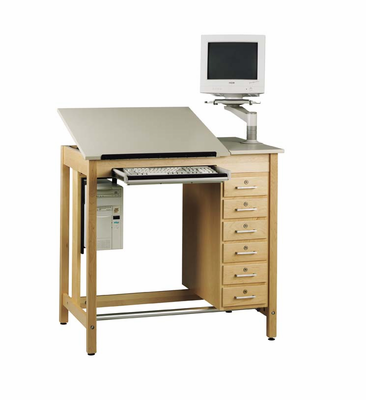 Do not worry about this drawing table system taking up too much space. This niffy little desk measures 42Wx30Dx39.75H. You can store this in the corner when you do not need it. This product will be perfect to use sitting and standing.